Our emergency first aid at work training is aimed at those organisations where a first aid needs assessment indicates a lower risk environment or where a course is needed to compliment other first aid provision. Whether you choose a single place on our open monthly course or training for an entire staff team, this one day course provides delegates with essential safe saving skills and knowledge. How do we approach emergency first aid at work training? 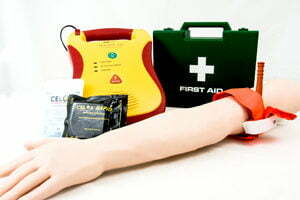 Our ‘emergency first aid at work’ course is just one of over 60 courses we offer. Acorn Health & Safety provides training and consultancy in first aid, fire safety, food safety, manual handling, healthcare training and health and safety.